Have you ever wondered how to engage kids in age-appropriate discussion about race and identity? Or, have you grappled with how to answer their questions about skin color, stereotypes, and the experiences of different races in the USA? If so, please join Saratoga Independent School at the Clifton Park Halfmoon Public Library (475 Moe Road, Clifton Park) for “How to Talk About Race with Children” on Tuesday, January 29 from 6-7:30 pm. The workshop will be led by Dr. Kristie A. Ford, Professor of Sociology and founder of the Intergroup Relations Program at Skidmore College, along with the Diversity and Inclusion Group of Saratoga Independent School. This workshop is open to the public. 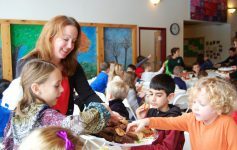 The Saratoga Independent School Parent Association, together with Lisa Brown, Head of School, formed a committee to focus intentionally on issues of race, diversity, children, and education. The committee believes that a focus on these issues is especially important given the demographic makeup of Saratoga County. Dr. Kristie A. Ford is professor of sociology and the Director of the Center for Leadership, Teaching, and Learning (CLTL) at Skidmore College. She received her B.A. in sociology from Amherst College and her M.A. and Ph.D. in sociology from the University of Michigan, Ann Arbor. Her research and teaching interests include race and ethnicity, gender and sexuality, and social justice education.